The Yupiit in southwestern Alaska are members of the larger family of Inuit cultures. Including more than 20,000 individuals in seventy villages, the Yupiit continue to engage in traditional hunting activities, carefully following the seasonal shifts in the environment they know so well. During the twentieth century, especially after the construction of the trans-Alaska oil pipeline, the Yup'ik people witnessed and experienced explosive cultural changes. 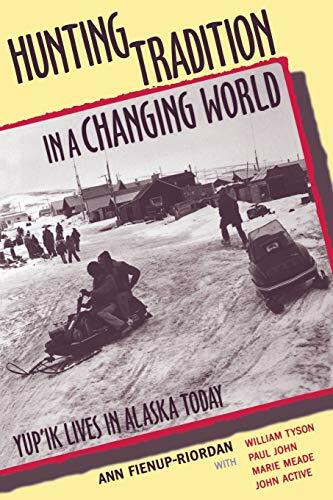 Anthropologist Ann Fienup-Riordan explores how these subarctic hunters engage in a "hunt" for history, to make connections within their own communities and between them and the larger world. She turns to the Yupiit themselves, joining her essays with eloquent narratives by individual Yupiit, which illuminate their hunting traditions in their own words. To highlight the ongoing process of cultural negotiation, Fienup-Riordan provides vivid examples: How the Yupiit use metaphor to teach both themselves and others about their past and present lives; how they maintain their cultural identity, even while moving away from native villages; and how they worked with museums in the "Lower 48" on an exhibition of Yup'ik ceremonial masks. Ann Fienup-Riordan has published many books on Yup'ik history and oral tradition, including Eskimo Essays: Yup'ik Lives and How We See Them, The Living Tradition of Yup'ik Masks and Boundaries and Passages. She has lived with and written about the Yupiit for twenty-five years.